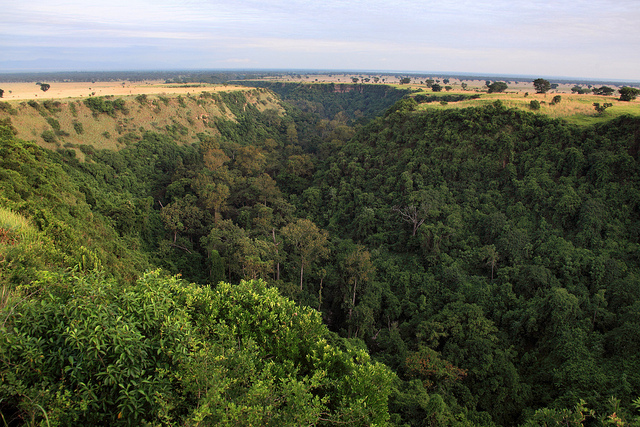 The Kyambura Gorge in Queen Elizabeth National Park is one of several places in Uganda where tourists can see chimpanzees in the wild. Andrew and I had stopped there the previous afternoon to check on the status of my chimp tracking permit. Nobody in the tracking office seemed to know whether I had a permit for the next morning or not, so they told me to just show up and hope there would be room in the group scheduled to leave at 8:30am. When Andrew and I arrived back at the gorge at 8am we found only one other tourist: Jake, an energetic 69-year-old Canadian. Jake said he was currently living in Israel and had just visited a Jewish community in Uganda. “There are about 1,500 of them now,” Jake said. “They’re descendents of a small group of Ugandans who converted to Judaism 90 years ago.” I asked how the Ugandans had been exposed to Judaism in the first place, and Jake explained that a Christian missionary introduced them to the Bible. The group that converted just decided they liked the Old Testament best. As I was taking photos of the gorge, Andrew yelled and pointed to a distant tree, where a small dark shape moved in the upper branches. A chimp! And we hadn’t even started our tracking hike yet! The chimp was too far away to get good photos, but it was exciting to see him. By 8:30 no other tourists had arrived, so our guide, Bernard, said it would just be the three of us – all the better for moving quickly and not frightening the chimps. We hopped into our vehicles and started driving along the rim of the gorge towards one of the trailheads. Before we’d covered much distance Bernard got a call on his mobile phone. 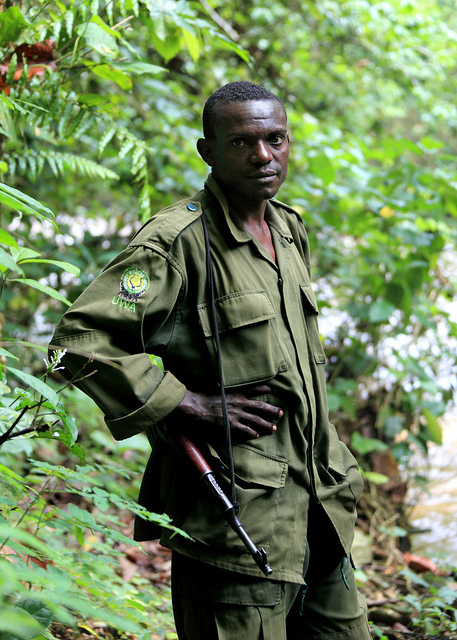 One of the rangers said he’d heard the chimp group down in the gorge by the office, so we turned around. By the time we got back to the office the scene had changed dramatically. And not for the better. 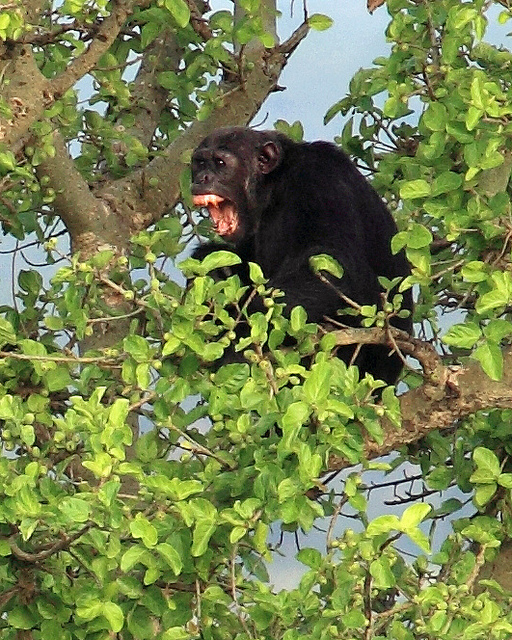 A loud, hulking bus had appeared, scaring off the chimps that were coming up from the gorge. The bus carried 16 Italian tourists. Their guide, an Italian who didn’t speak much Kiswahili, was arguing heatedly with the park rangers. The guide wanted all of his tourists to see the chimps, and the park rangers were explaining that no more than 8 people were allowed to go tracking each morning. The guide finally realized he wasn’t going to get his way, but instead of leaving he picked six of his tourists to join our group that morning. Our stealthy, lean strike force of three became a noisy, lumbering gang of nine. We tromped down into the gorge. 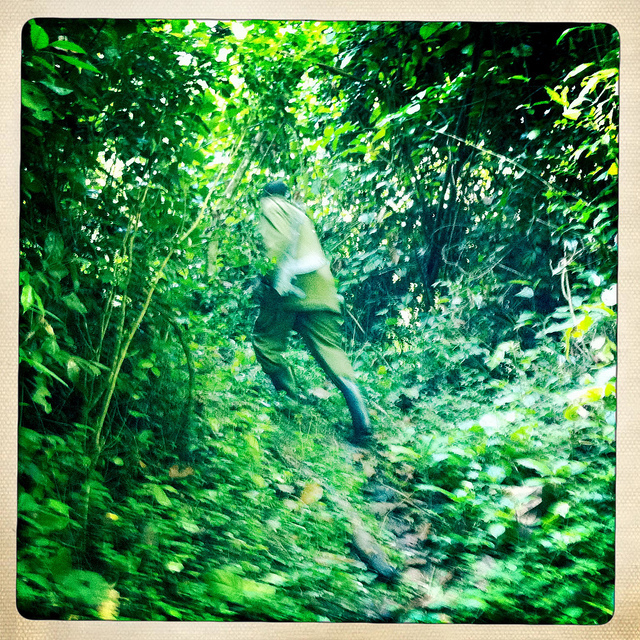 The trail to the river at the bottom of the gorge was somewhat steep, but after the extremes of Bwindi it felt almost leisurely. Bernard took the lead, with Jake and me following him closely. The Italians fell behind right away and kept yelling at Bernard to wait. Bernard was irritated with them to begin with, and I think he enjoyed pushing them a little bit. We reached the river and followed it downstream. 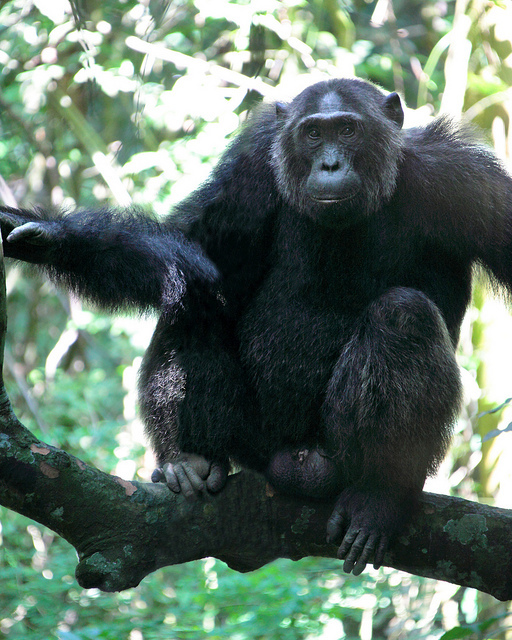 Bernard suspected the chimps were on the other side of the gorge, which meant we had to cross the river. “Where is the bridge?” I asked. 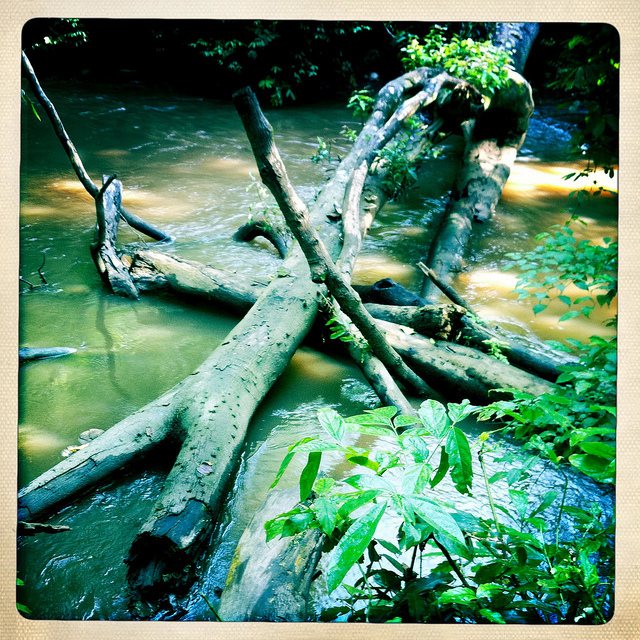 “Right there,” answered Bernard, pointing to a tree that had fallen across the river. I have to give the Italians credit – they didn’t balk for a second. Our whole group made the crossing, despite the fact that it would have been very easy (at least for me) to make a small slip and drop into the water. On the other side of the river Bernard heard the chimps. At one point he plunged down an almost-vertical slope by himself to investigate some branches he’d seen shaking. 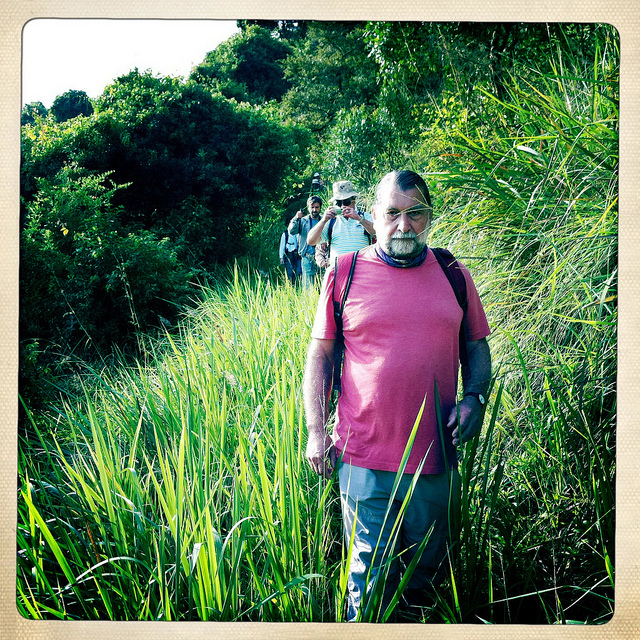 When he returned to the trail he told us to reverse direction. 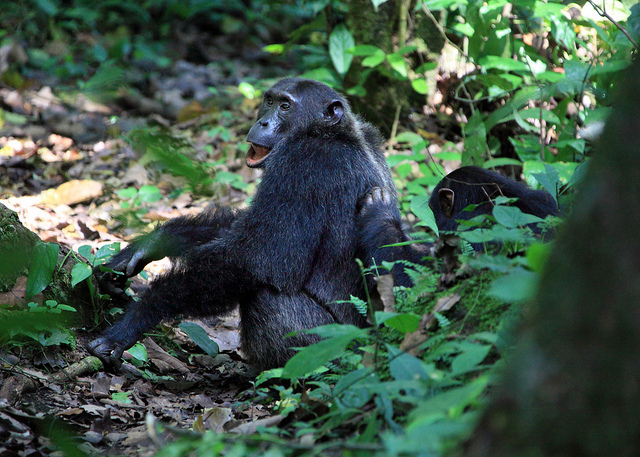 He suspected that some of the chimps had slipped around us and were heading the other way. He was spot on. 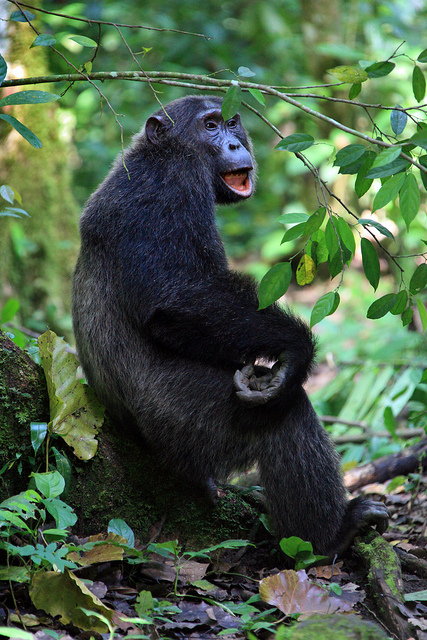 Within five minutes Bernard pointed to a lone chimp eating leaves in the trees below us, its face mostly blocked by the heavy vegetation. The Italians, who had lagged behind all morning, suddenly rushed up and elbowed me aside. Remembering my experience with the mountain gorillas, I tried to relax and not worry about getting the perfect shot. Jake, who had a good angle, generously offered to switch places so I could see better. Bernard heard more noises and led us off at a fast trot. 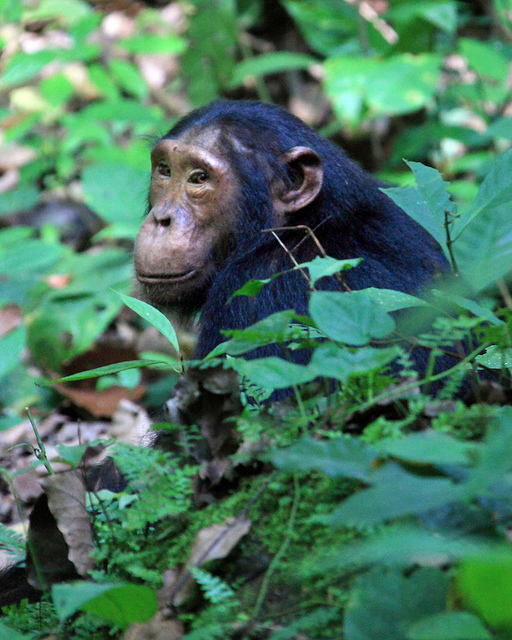 We stopped abruptly and Bernard silently nodded towards three chimps on the trail in front of us. 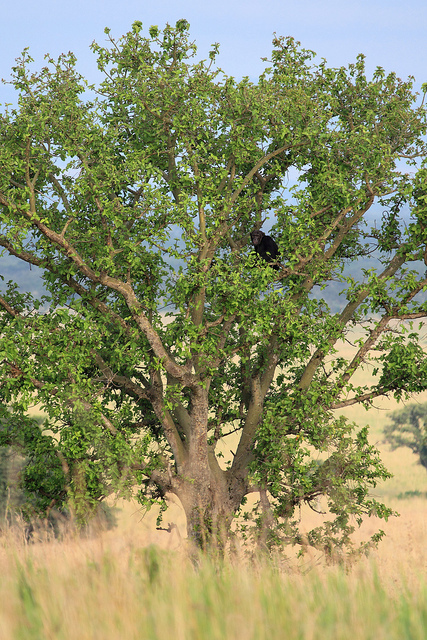 One was Rufus, the dominant male. Our large group frightened them, so every time we approached they quickly scurried away. Getting good photos was almost impossible – the jungle canopy hid the chimps in shadows, the Italians had no problem stepping in front of my camera, and the chimps almost never stopped moving. 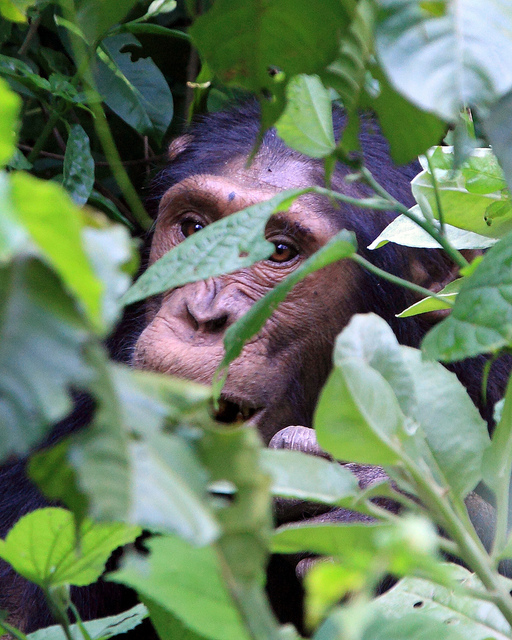 But it was really, really fun to be that close to chimps in their natural environment. And I didn’t let the Italians win all the turf wars. The chimps vanished into the jungle. We weren’t able to find them again and Bernard told us it was time to climb out of the gorge. We made our way back up to the rim, emerging directly opposite the tracking office. Bernard called the office and had the rangers tell our drivers to come pick us up. The Italian guide had left, however, and the Italian tourists couldn’t reach him on the phone. Bernard was furious. “Your guide does not know what he is doing!” he complained. “You should know better. What were you thinking? Now I have to wait with you!” After that Bernard refused to look at or talk to the Italians. Jake and I played peacemakers. We had enough room for the Italians in our two vehicles and were able to drive the whole group back to the tracking office. 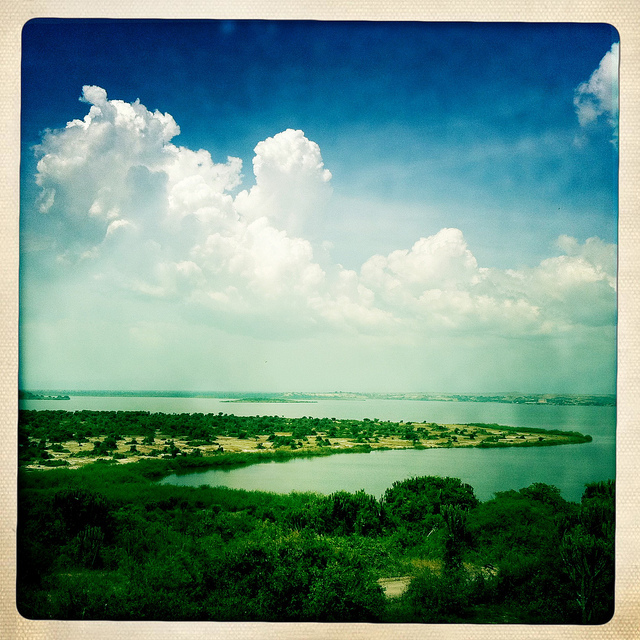 Andrew and I returned to the Mweya Lodge for lunch. I thought Andrew was coming in to eat with me, so I put on my sandals and left my hiking shoes – which were still wet from the rain and mud in Bwindi – next to our car to dry in the sun. Andrew walked into the lodge with me and said to go ahead while he stopped to talk with someone. Halfway through lunch Andrew still hadn’t joined me, and I started to worry that he might have driven off without my shoes. No problem, I thought, a hotel employee will just pick them up. After lunch Andrew was waiting for me outside the lodge. But my hiking shoes were gone. “Have you seen my shoes?” I asked him. At the lodge’s front desk I repeated my story and received a similar response. Three hotel employees gathered around to stare at the mzungu who was foolish enough to leave his shoes in the parking area. One employee used a walkie-talkie to check with the groundskeepers, the second made a phone call to housekeeping, and the third tried to get me to explain my bizarre behavior. The shoes never turned up. Who would want old, wet, muddy hiking shoes? Do warthogs eat footwear?